Divi is the latest theme from Elegant Themes and is rising in popularity thanks in large part to its exceptional visual appeal and host of included features. In fact, Divi comes with a powerful built-in page builder, 20 pre-designed layouts, and 46 content modules for endless customization. 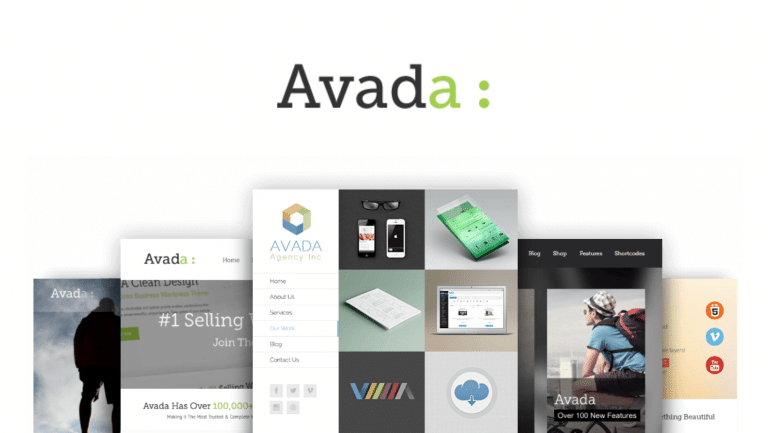 This theme is flexible, intuitive, and responsive by nature. Built to impress every site visitor that clicks on your website, and provide an exceptional user experience, there is a reason this theme is one of the best. Because Divi provides website owners complete control over every aspect of their website and caters to website owners of all kinds, it is easy to find real life examples of websites built on this theme’s strong foundation. Today we will take a look at a variety of website types currently using the Divi theme. Who knows, you may be inspired to build your own Divi website. 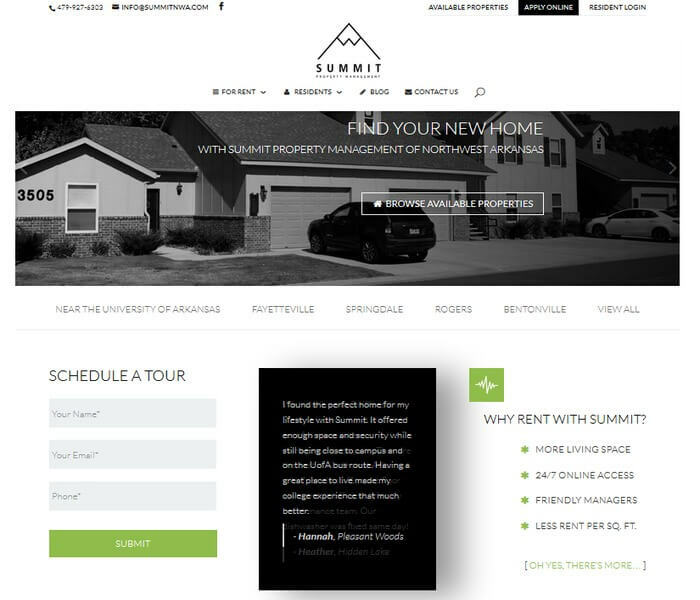 Divi provides all of the tools needed to create any kind of real estate website and Summit Property Management utilizes these tools well. For example, agencies of all sizes can promote their business, services, and listings. Display crisp clean images that are responsive as a gallery of potential homes for sale or rent. Or, create your own personalized layout using Divi’s content modules for information like maps, open house events, video tours of homes, pricing tables, and testimonials of satisfied customers. Gravity Forms. Create powerful, high converting forms on your website for connecting with site visitors and increasing sales. Testimonial Rotator. Easily add testimonials to your website for added social proof. 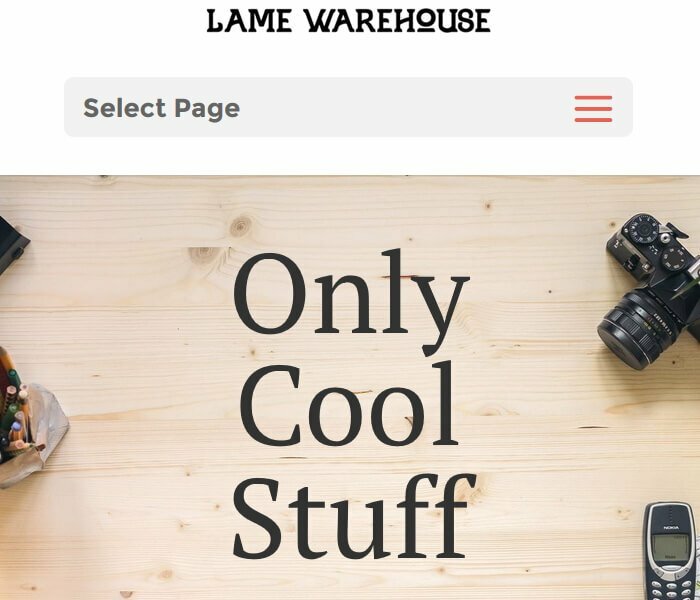 When you set up an eCommerce shop, like the one found here at Lame Warehouse, one of the most important things to think about is compatibility between your eCommerce platform and WordPress theme. Luckily for you, Divi is 100% compatible with the leading eCommerce plugin solution – WooCommerce. In addition, Divi comes with a convenient Shop Module making it easier to sell products on your website. Using the drag & drop page builder, easily add product images and descriptions. Choose from three online shop layouts for easy shop setup. And, don’t forget to keep in touch with customers by adding maps, contact forms, and translation switchers. Bloom. Design a perfectly branded email opt-in form that converts visitors into customers using Divi’s exclusive opt-in form plugin. WooCommerce Multilingual. Build an international presence by translating your content. Do you own a restaurant, have food products for sale, or just want to share yummy recipes with your loyal readers? 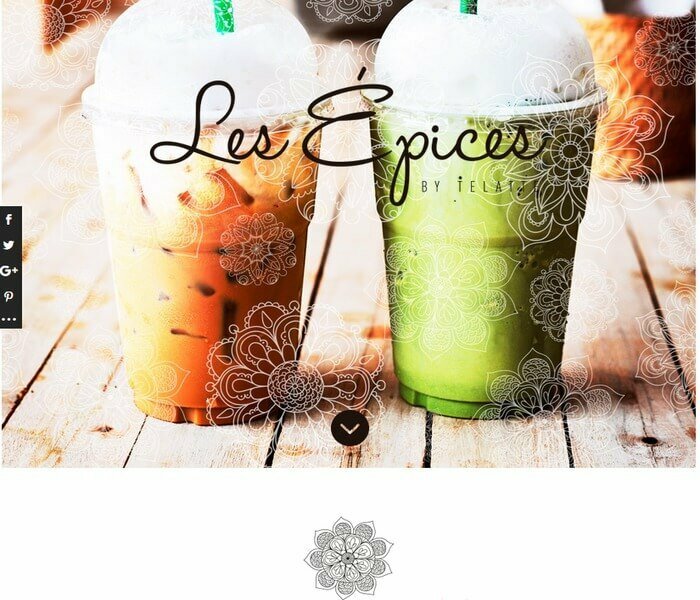 Well, Les Epices does and is a perfect example of how you can do the same using Divi. Divi gives you the perfect opportunity to create a delicious looking foodie website with all the extras on the side. This is especially true if you draw some ideas from the included Divi Café demo content. 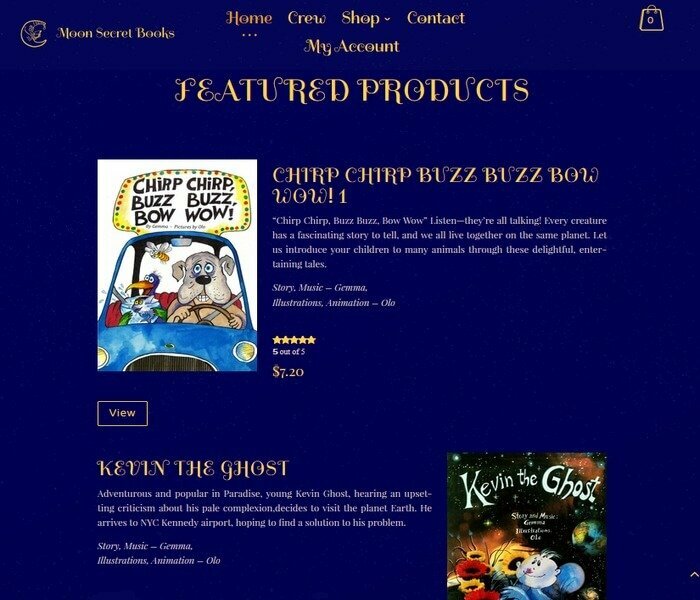 Blog about recipes, include a menu for customers to view, and even set up an online shop for selling foodie gift baskets. Monarch. Social sharing is the crux of any good website, especially a restaurant. Use Elegant Themes’ Monarch Social Sharing plugin and expand your brand. Menu Icons. Add some visual appeal to your menu items using this free menu icons plugin. Although many health and fitness centers have brick and mortar buildings to visit, it is not unusual to see a fitness company have a related health and wellness website. For instance, maybe the local gym you frequent has a blog with health tips for living a healthy life. In addition, as with The London Movement, many fitness centers seek to make signing up for exclusive classes easy on their customers – via an online portal. The important communication elements this company incorporates into their Divi theme setup include a mailing list opt-in form, a contact form for questions or concerns, and an advanced commenting system for increased visitor interaction. Contact Form 7. Create multiple contact forms with this free, AJAX powered, CAPTCHA included, and Akismet spam-filtering plugin. WP Advanced Comment. Encourage user engagement with this highly advanced drag & drop commenting system. Whether you have an eCommerce shop for kids, run a childcare center, or schedule children’s parties, Divi has the functionality and design to make your website stand out. Take for instance Moon Secret Books. Implementing some of Divi’s best plugins, as well as a host of other great free plugins, this website is colorful, fun, and playful. In addition, it makes use of many different content types such as audio and video to entice customers, engage the senses, and encourage purchases. Divi Switch. Toggle over 50 switches such as Calls to Actions, Overlay Transitions, and Instagram Filters for increased site customization. Divi Commerce. Create a beautifully matched eCommerce website using a Divi inspired eCommerce platform. Landing pages are all the rage these days and rightfully so. They attract, convert, and retain site visitors and turn them into regular customers. 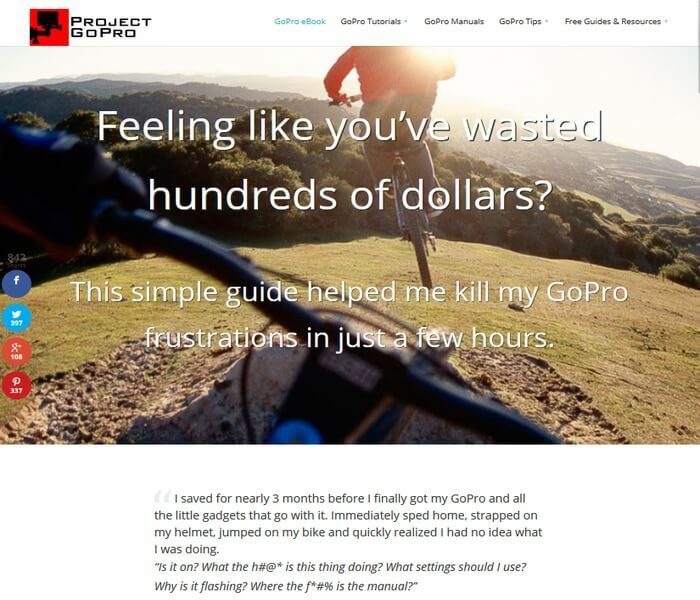 For example, Project GoPro looks to capitalize on the many features GoPros offer users by selling them an e-book to help them figure out every little detail related to their GoPro camera. Designed as a landing page using the Divi theme, this website displays a captivating header image, clear call to action buttons, and a floating sidebar social share bar. OptinSkin. Custom design unique opt-in forms using any of the 18 default designs intended to gather more subscribers and boost sales. WP Super Cache. Exceptional user experience boils down to fast page loading. As a landing page website this is a must and is easily achieved using this plugin. 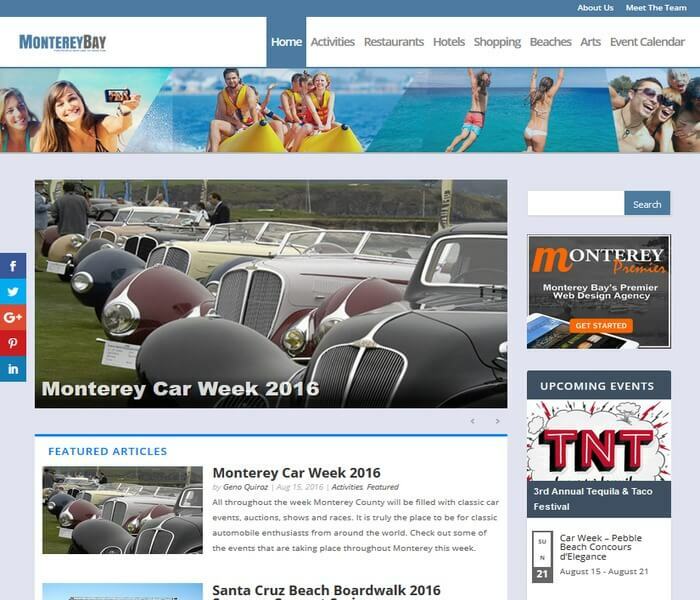 Blog about your world travels, endorse your hotel accommodations, or even run a magazine website dedicated to fun vacation spots using the versatile Divi theme; just like Monterey Bay Fun does. For example, add a social share floating bar, add responsive images, include a full width header image, and customize your color scheme to match your brand. Enjoy Plugin for Instagram. Share your best Instagram shots with site visitors to spread the joy of traveling. The Events Calendar. Inform readers about upcoming events complete with descriptions, directions, and even images. In the end, the ways you can utilize Elegant Themes’ Divi theme are endless. Divi caters to websites of all kinds and stays true to its multipurpose title. Plus, it plays well with a large number of popular and useful WordPress plugins so you can create the perfect website. Have you ever created a website using the Divi theme? I would love to hear all about it in the comments below!